There's no doubt that Calgary's Mayor Naheed Nenshi is a popular guy across Canada. Whether it was praise for his cool-headed handling of Calgary's June flood or occasional cheeky remarks on Twitter, the man has been the inspiration for t-shirt designers several times. 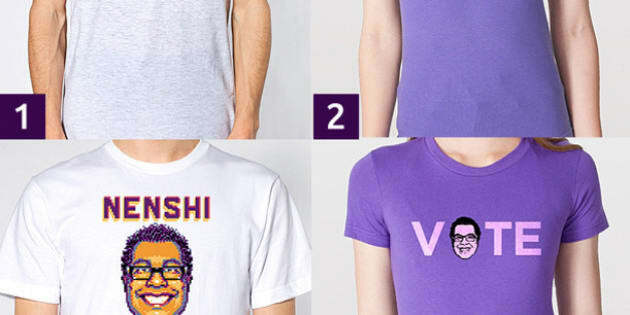 Most recently, Nenshi t-shirts created by a local designer were released as part of his upcoming election campaign. Each donation of $25 to the campaign can choose from one of four shirt designs, which include a "Nenshi - My City, My Mayor!" and "VOTE" with Nenshi's face standing in as the "O." "I still don't get why people want my face on their bodies," said the mayor on Twitter when talking about the shirts, adding all four shirts are "neck-and-neck" in popularity. This isn't the first time Nenshi's face has adorned the front of a cotton shirt. Numerous designs were created to fundraise for Alberta flood relief in June, including "Keep Calm and Nenshi On," and a popular T-shirt with Nenshi donning scuba gear.